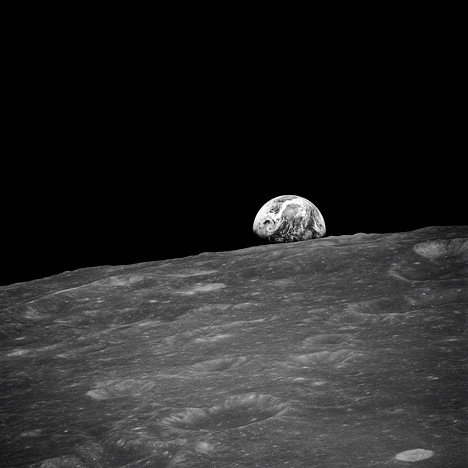 The black and white photo above is the first photo of an earthrise taken by a human. It was photographed by Apollo 8 mission commander, Frank Borman. 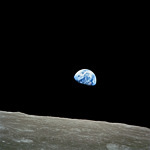 However, the color Earthrise photo below is one the most recognized images of all time. The earliest known earthrise photo was taken two years earlier on 23 August 1966 by the unmanned Lunar Orbiter 1. The color photo, taken moments after the black and white version by astronaut William Anders has been called "the most influential environmental photograph ever taken". Anders has famously said "We came all this way to explore the moon, and the most important thing is that we discovered the Earth". The two astronauts, Borman and Anders, have had a minor argument about who took the first picture. Personally, I like the less recognized and earlier black and white version with the Earth on the lunar horizon. These photographs changed the way humanity viewed itself; We realized how frail and isolated we were. The whole world fit into a single frame. The most recognized and most widely distributed photograph of all time is believed to be The Blue Marble taken in 1972. The universe is beautiful. NASA's Astronomy Picture of the Day Archive hosts some of the most amazing images with brief but highly educational explanations. Thirstyfish.com was partially inspired by this site.